Most importantly for me is a good cleanser, it’s the perfect relaxing end to the day and I expect it to remove all my makeup. Luckily I have a travel friendly of my favourite, the Omorovicza Thermal Cleansing Balm, it removes all my makeup easily meaning I save space by not needing to take eye makeup remover. The Caudalie Beauty Elixir is one item which I never travel without, wether I’m going on a 5 hour flight or simply for a night away this always come. I find it to be very soothing and although it may not make a huge difference to my skin its one which I love to use and that doesn’t take up much time. 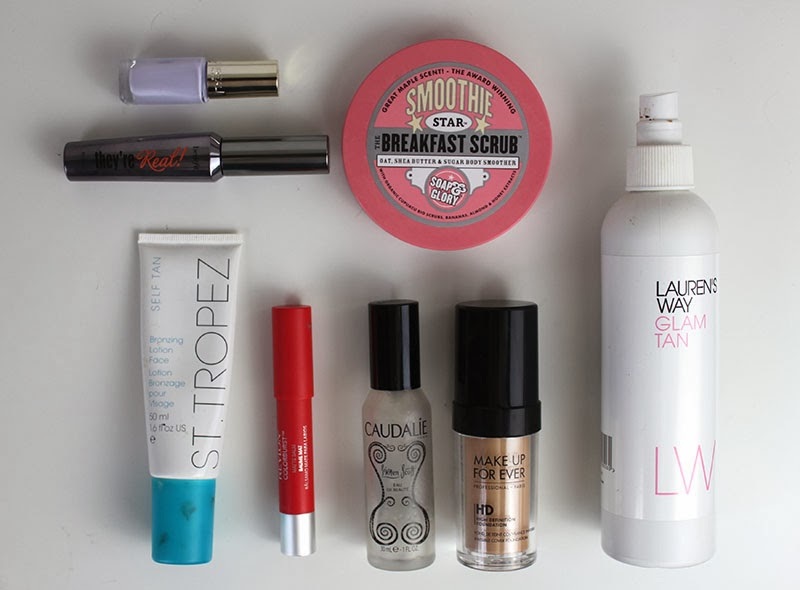 I often use it over my makeup too, as a setting spray or just to freshen up my makeup a little. 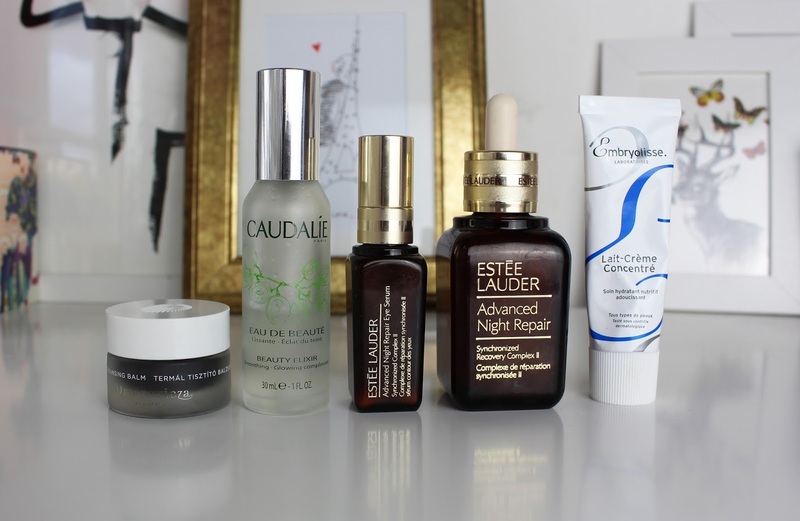 The Estee Lauder Advance Night repair face and eye serum are my favourite duo, as although they I use them in the evening I can also use them in the morning for a little extra TLC. They both sink in easily but leave my skin looking glowy and hydrated, it’s my favourite step after cleansing as I find my skin really loves it. Finally a cream which I use both day and night is the Embroyolisse Lait-Creme, I love the size of this one and I sometime use it on my body, meaning that it does three jobs in one! What products do you always travel with? Really I wanted a photo around the pool with the favourite facial sprays but in reality they’re just too heavy for me to justify bringing them all on holiday so I had to take the photo back in London. It was hard to chose which ones to bring with me away on holiday but I decided to simply pack the lightest ones. 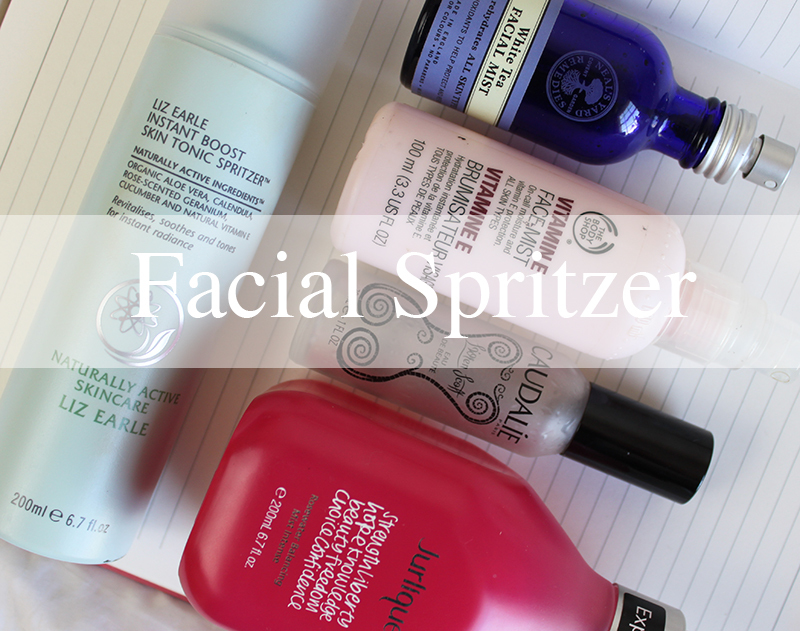 I love facial spritzers; to freshen up on a hot day, to finish off my makeup and to help hydrate my skin. This baby has been raved about for years now on beauty blogs, it’s filled with essential oils of orange blossom, mint and rose which helps reenergise the skin. Perfect for under or over makeup to add a little radiance, a nice tip is to keep it in the fridge to make it even more refreshing. This may actually be my favourite of them all (although this bottle is far too large and difficult to hold) This one smells divine and is always what I reach for when I need to be awakened, the scent is also particularly comforting meaning it’s my favourite product to use during a long day especially as I find it to help calm my skin too. When I am really looking for hydration I find that this product helps the most in terms of facial sprays, this is my second bottle and I could really see a difference when I went back to it. I love to use this one before makeup to really help give me a dewy finish. Out of all the product I have mentioned this is the one I use most like a standard toner after cleanser however I also love the smaller travel size one to carry around in my hand bag. It contains cucumber, aloe vera and calendula to calm the skin which is always great any time of the day. The 100ml bottle means that you can travel with this and you have enough product to apply generously both on the plane and during your holiday, it’s also in a light plastic bottle so it won’t weigh you down. It’s great to set makeup and really helps my makeup last a little long while making it look a little more natural and dewy which I love. It got a much lighter rose scent than the Jurlique Rosewater mist if thats something you’re quite sensitive to. For the price it’s such a great product! Which are your favourite Facial Spritzers and what do you like to use them for? Fake Tan has been a big thing for me this month and I’ve been on a quest to be perfectly brown. To achieve this I have been loving the Lauren’s Way Glam Tan which is almost certainly my favourite fake tan. Easy to apply, streak free and the most amazing brown colour without a single hint of orange! However I no longer use this on my face as I find the St Tropez Facial Bronzing lotion to be far more flattering and less harsh. In between applications I have rediscovered the Soap & Glory Breakfast Scrub which is the best body scrub going; it leaves no residue but gives great exfoliation! Whilst in Paris I purchased the Make-up For Ever HD Foundation and fell in love… again. I can’t believe I didn’t own (I’ve had two or three bottles in the past) and it is just the perfect amount of coverage and a beautifully natural finish. I rediscovered the Benefit They’re Real Mascara which is intensely black and really adds volume. I also found this stunning Revlon Matte Balm in Striking photographs really well and also is a great go-to colour if you’re running late but need to look put together. To finish it all off I have been reaching for the Caudalie Beauty Elixir just as a finishing spray and to stop my makeup looking too heavy. I thought I wouldn’t love this but I have got through it super quick- shame it’s not a little cheaper! And a sneaky entry is the L’Oreal Color Riche Nail Polish in Nouvelle Vague– it’s just too perfect/pretty not to include! Check out my video below and don’t forget to subscribe (It’s Free and you can do it here)! What products have you been loving? 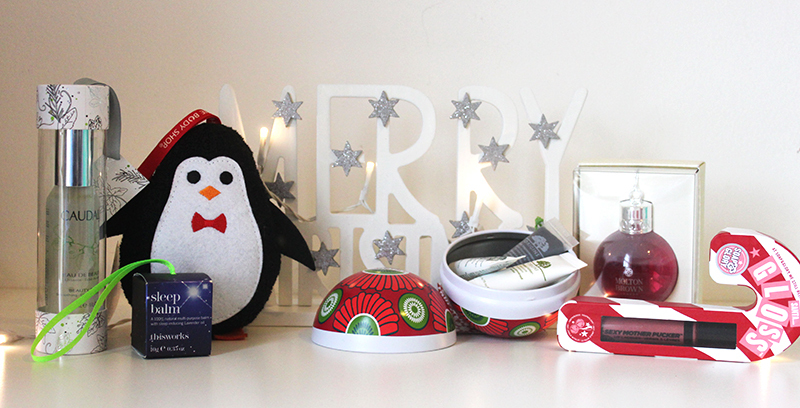 Today I have another very exciting giveaway worth £122! 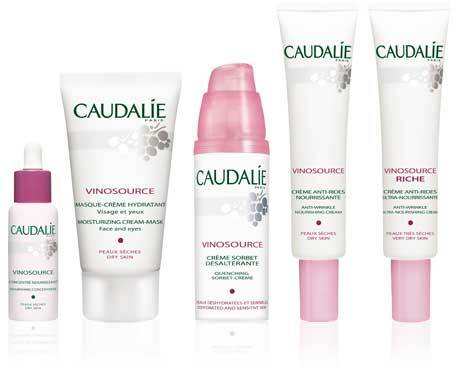 I first tried Caudalie Vinosource Sorbet Crème when it came in the October Carmine box but today I have five products to giveaway! Moisturizing Cream-Mask for Face and Eyes (RRP £21.50).